While many critics have analyzed the influence of the FDR administration on Hollywood films of the era, most of these studies have focused either on New Deal imagery or on studio interactions with the federal government. Neither type of study explores the relationship between film and the ideological principles underlying the New Deal. This book argues that the most important connections between the New Deal and Hollywood melodrama lie neither in the New Deal iconography of these films, nor in the politics of any one studio executive. Rather, the New Deal figures prominently in Hollywood melodramas of the Depression era because these films engage the political ideas underlying welfare state policies—ideas that extended the reach of government into the private realm. 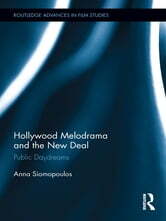 As the author shows, Hollywood melodramas interrogated New Deal principles of liberal empathy—consumer citizenship, the refeudalization of the state, and minimal economic redistribution—only to support welfare-state ideology in the end.